Darren Sammy, the hard-hitting West Indian allrounder, has signed a deal with Glamorgan to play in the NatWest T20 Blast until the Caribbean Premier League begins. Sammy has received a No Objection Certificate from the WICB and will arrive in time for Glamorgan's next T20 Blast fixture, against Sussex on Friday. 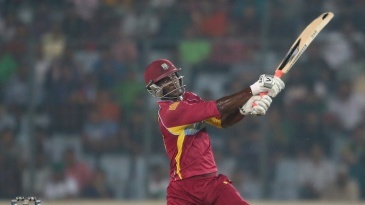 He could be available for seven matches before returning to the West Indies to captain St Lucia Zouks in the CPL. The deal is one of few secured by the counties for overseas players in the new T20 Blast which is spread over the course of the season. Having captained West Indies to the World T20 title in 2012, Sammy will add international quality to a Glamorgan side who have won one and lost one of their opening two T20s. Sammy showed his ability in the recent World T20 in Bangladesh with a match-winning 34 in just 13 balls against Australia. Sammy has just finished a season in the IPL for Hyderabad, where he stood in as captain in latter stages, but endured a poor tournament with only 108 runs at 15.42 and his 14 overs across 10 matches costing 11.21 per over. Sammy recently retired from Test cricket, almost immediately after being replaced as captain, and therefore is not engaged in West Indies Test series against New Zealand in June. But he could be called up for the two T20s which follow the Tests, potentially curtailing his time at Glamorgan. "Darren's skills with bat and ball have delighted crowds all around the world in Twenty20 competitions in recent years so we're delighted to welcome him to Glamorgan," Hugh Morris Glamorgan chief executive said. Head coach Toby Radford added: "Darren is a top quality T20 player and a fine addition to our dressing room as he brings with him experience at the highest level. Darren was a leader on and off the field during my days with the West Indies, so it will be great to work with him again at Glamorgan."